Schiff, K. 2010. Lessons from Watershed Monitoring in Southern California . Prickett, L. 2010. Low Impact Development: Implementation Examples and New Directions. Ridolfi, K. 2010. LTMS Symposium Summary: Green Sturgeon, Longfin Smelt, and Dredging Operations in the San Francisco Estuary. Collins, J. N. 2010. Managers' wrap-up. Greenfield, B. K.; Jahn, A. 2010. Mercury in San Francisco Bay forage fish. San Francisco Estuary Institute: Oakland, Ca. Mumley, T. 2010. The Municipal Regional Stormwater Permit. Sansalone, J. 2010. Myths, Models, and Monitoring for Rainfall-Runoff Controls. Ridolfi, K.; McKee, L. J. .; Pearce, S. 2010. Petaluma River Impairment Assessment for Nutrients, Sediment/Siltation, and Pathogens Part 1: Existing Information and TMDL Comparison. Aquatic Science Center: Oakland. Klosterhaus, S. 2010. Procedures for the Collection and Storage of Environmental Samples in the RMP Specimen Bank. San Francisco Estuary Institute: Oakland, CA. McKee, L. J. . 2010. Recent Advances in Bay Area Stormwater Science. Klosterhaus, S. 2010. Recent studies on the identification an occurrence of PentaBDE replacement chemicals in indoor and outdoor environments. Davis, J. A. 2010. Review of Agenda and Goals of Meeting. 2010. RMP 2010 Annual Meeting Agenda. Davis, J. A. 2010. The RMP Mercury Strategy: Approaching a Crossroads. Sommers, C. 2010. The RMP Small Tributary Loading Strategy. Collins, J. N. 2010. Roundtable discussion. Pearce, S. 2010. Sediment Loading from Local Tributaries. Jabusch, T. W. 2010. Selenium in the Grasslands Watershed. San Francisco Estuary Institute: Oakland, CA. pp 267-294. Taberski, K. 2010. SWAMP: Monitoring the Health of Our Watersheds. Taberski, T. 2010. SWAMP: Monitoring the Health of Our Watersheds. Klosterhaus, S. 2010. Update on Contaminants of Emerging Concern. Tjeerdema, R. S.; Jabusch, T. W. 2010. Use of environmental fate processes to mitigate impacts on urban water quality. Askevold, R. A. 2010. Using GIS to Recreate Historical Habitat Patterns. Pearce, S.; McKee, L. J. . 2009. Alameda Creek Bulk Sediment Study Technical Memorandum. Pearce, S.; McKee, L. J. . 2009. Alameda Creek Bulk Sediment Study Technical Memorandum. San Francisco Estuary Institute: Oakland,Ca. Klosterhaus, S. 2009. 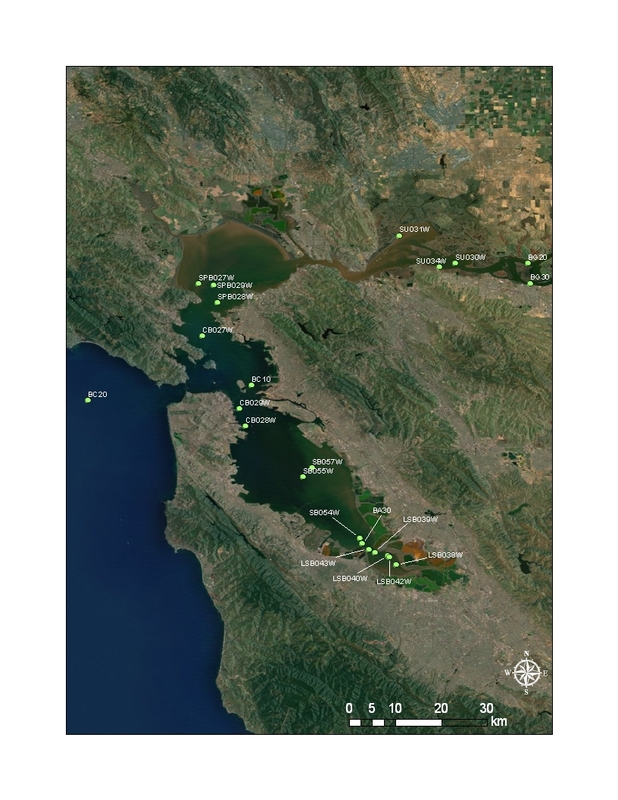 Alternative Brominated Flame Retardants in San Francisco Bay Wildlife and Sediments. 2009. Bay Area Base Map. Klatt, M.; Cayce, K.; Williams, M.; Collins, J. N. 2009. Bay Area Base Map of Aquatic Habitats. Ritter, K. J.; Huff, D. D.; Oakden, J. M.; Thompson, B.; Velarde, R. G.; Cadien, D. B.; Ranasinghe, J. A.; Weisberg, S. B.; Smith, R. W.; Montagne, D. E. 2009. Calibration and evaluation of five indicators of benthic community condition in two California bay and estuary habitats. Marine Pollution Bulletin 59 (1-3), 5-13. Klosterhaus, S. 2009. Characterization of Organophosphorus Chemicals in a PentaBDE Replacement Mixture and their Detection in Biosolids. David, N. 2009. Comparison of Agricultural Runoff between Organic Farming and Conventional Chemical Farming. Klosterhaus, S. 2009. Contaminants of Emerging Concern: An Update on RMP Activities. 2009. Copper 2009 Sample Locations Map. Jabusch, T. W.; Ballard, A. 2009. Delta RMP: Developing a Delta Regional Monitoring Program for Contaminants. Stapleton, H.; Blum, A.; Webster, T. F.; Klosterhaus, S.; Eagle, S.; Fuh, J.; Meeker, J. D. 2009. Detection of Organophosphate Flame Retardants in Furniture Foam and U.S. House Dust. Environmental Science and Technology 7490–7495 . SFEI Contribution No. 591. Klosterhaus, S. 2009. Detection of Organophosphate Flame Retardants in Furniture Foam and US House Dust and Indoor Air. Klosterhaus, S. 2009. Emerging Problems? Identifying Contaminants of Concern in San Francisco Bay. Grosso, C. 2009. Environmental Data Upload and Visualization Tools. Kelley, K. M.; Reyes, J. A. 2009. Environmental Endocrine Disruption in Wild Fish of San Francisco Bay. SFEI Contribution No. 643. SFEI: Oakland. p 128. Klosterhaus, S. 2009. Flame Retardant Chemicals in San Francisco Bay: More than Just PBDEs. Cayce, K. 2009. Georectification and Interpretation of Historical Maps on California Coast. Lent, M. A.; Oram, J. J.; McKee, L. J. . 2009. Guadalupe Watershed Model. Lent, M. A.; Oram, J. J.; McKee, L. J. . 2009. Guadalupe Watershed Model Support Tool for Regional Hg and PCBs Management. Lent, M. A.; Oram, J. J.; McKee, L. J. . 2009. Guadalupe Watershed Model Year 1 Report. Oakland, CA. Askevold, R. A. 2009. The Historical Ecology of Eastern Contra Costa County: Preliminary Findings. Ackerman, J.; Eagles-Smith, C. 2009. Integrating Toxicity Risk in Bird Eggs and Chicks: Using Chick Down Feathers To Estimate Mercury Concentrations in Eggs. Environmental Science and Technology 43, 2166-2172. Council, C. Ocean Prot; Project, S. California; Urban Water Research Center, U. of C. I.; Trust, C. Ocean Scie; National Water Research Institute; San Francisco Estuary Institute. 2009. Managing Contaminants of Emerging Concern in California: Developing Processes for Prioritizing, Monitoring, and Determining Thresholds of Concern. Eagles-Smith, C.; Ackerman, J. 2009. Mercury-Selenium Effects on Reproductive Success of Forster's Terns in San Francisco Bay. USGS: Davis, California. p 26. Klosterhaus, S.; Davis, E. F.; Stapleton, H. M. 2009. Organophosphate Flame Retardants in San Francisco Bay Biosolids and Sediments. Klosterhaus, S. 2009. Organophosphate Flame Retardants in San Francisco Bay Biosolids and Sediments. Cohen, A. N.; Zabin, C. J. 2009. Oyster shells as vectors for exotic species. Journal of Shellfish Research 28 (1), 163-167 . SFEI Contribution No. 709.